It's the middle of summer and I'm eating soup. Rich, warm, perfect-for-a-cold soup...and I can't get enough of it. This thick carrot puree is simple by design and easy to make, but there's a couple of ingredients that really take this to the next level and give it some gourmet pizazz. Aside from all the dicing and chopping for the veggies, this soup is pretty hands-off. And because everything is going to be pureed in the end, your pieces can be pretty rough; just make sure they're somewhat even so they'll all cook uniformly. 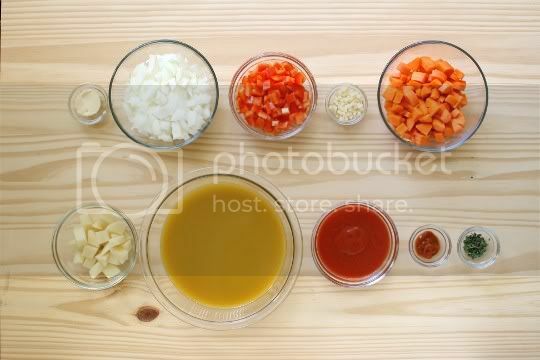 Saute onions, peppers, and garlic in a pot, then add carrots and potatoes (for thickness). Add broth and tomato sauce, along with harissa and fresh thyme. This was my first time using harissa (a Tunisian hot pepper sauce), and I really love it. The possibilities for this stuff are endless: you could add it to soups, stews, salsas, or veggies, or even use it as a condiment (sriracha, watch out!). It's spicy (but peppery, not overly hot), tangy, and pungent. The soup cooks for only 30 minutes, then you'll puree the whole batch and season with salt and pepper. I didn't think I could be so in love with a carrot soup, but my nose is wide open! Well, the harissa could have something to do with that. 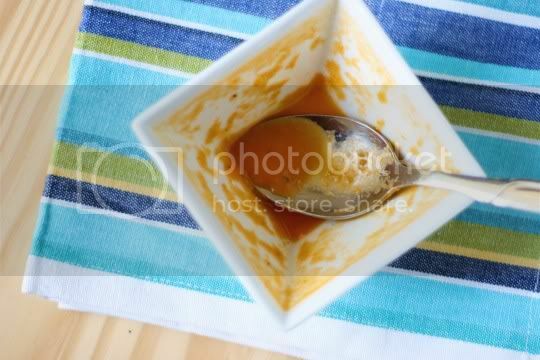 The soup is so flavorful: sweet, tangy, pungent, spicy, and salty. It's rich and velvety in texture; in fact, this is more of a bisque texture than soup. Because of that (and the potatoes), it's surprisingly filling, and is a wonderful pairing with a small sandwich or salad. This would be the perfect soup to eat to fight off a cold or flu. Its pepperiness and heat really gets the sinuses going, but without setting your mouth on fire. The addition of thyme adds woodsy, aromatic notes as well, so just imagine what delightful scents you get as you eat this. Make again? Definitely. It's so delicious and addictive, I'd have no problem making this year-round. Melt butter in large pot over medium heat. Add onions, peppers, and garlic, and sauté 3 to 5 minutes, or until soft, stirring often. Add carrots and potato and cook 4 to 5 minutes more. Add broth, tomato sauce, harissa, and thyme. 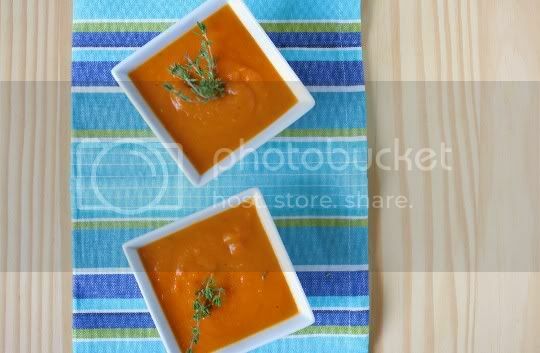 Reduce heat to medium-low and simmer 30 minutes, or until potatoes and carrots are soft. Transfer mixture in small batches to blender or food processor, or use an immersion blender, and purée until smooth. Add salt and pepper, and stir well. 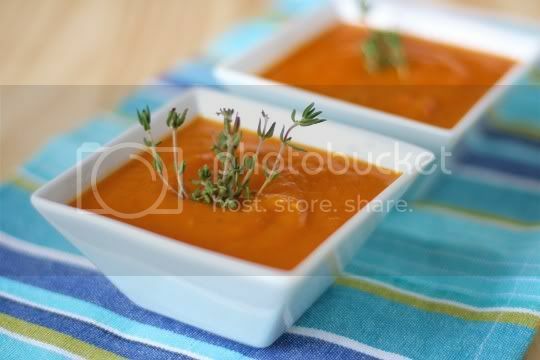 Serve hot, garnished with thyme leaves if desired. Serves 4-6.